The front door to your home can really make a statement. It’s one of the first things guests see when they come to visit, and the first thing that greets homeowners when they come home from a long day at work. The look of a front door can have an effect on the appearance of an entire house, and it’s important to consider what kind of look you are going for. Have you considered the materials? 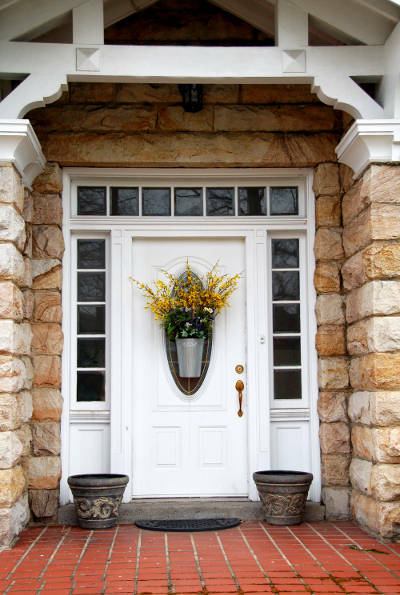 Fiberglass is a relatively new option for front doors, and sit should be strongly considered. Since the materials are synthetic, they can be designed for maximum energy efficiency with foam filling and customized to look like whatever the homeowner desires. Homeowners may also find themselves considering a wood door. 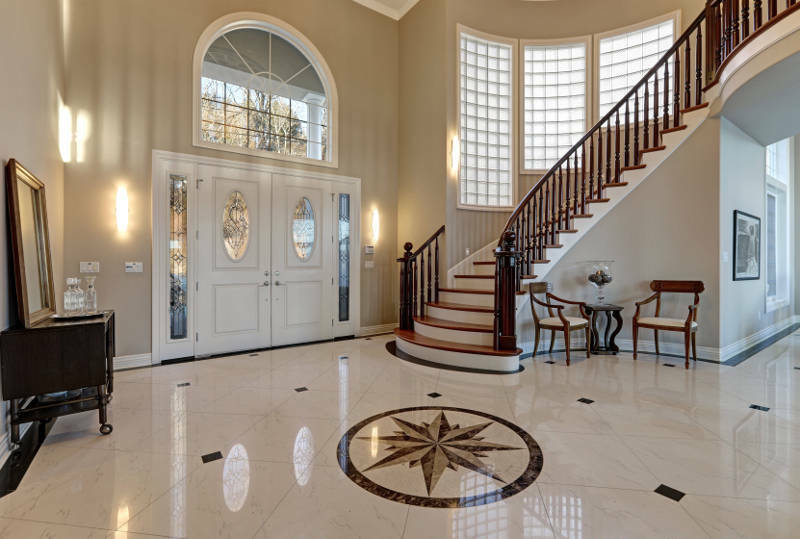 Large wooden doors can be very warm and inviting, creating an attractive entryway. However, are they a practical investment? We take a look at five different features homeowners may wish to think about when buying a door, and compare the fiberglass door to the wooden door. Fiberglass vs wood doors – which material is the winner? Read on to find out! Fiberglass – Since fiberglass is a synthetic material, manufacturers can create doors that are efficient enough to receive Energy Star ratings. The core materials in fiberglass doors are made of polyurethane which adds to the energy efficiency. In addition, fiberglass doors are constructed to fit perfectly into a door frame, which means there will be no air leakage when your front door is closed. No air leakage means a lower heating bill for the homeowner. Some fiberglass front doors, like the ones at Feldco, have a foam core which makes them even more energy efficient. Foam makes it difficult for heated or cooled air to escape through the door slab itself. Wood – In contrast, wood doors don’t offer much in the way of energy efficiency. Since it’s a natural material, it’s difficult to alter the wood in a way that would meet the qualifications to receive an Energy Star rating. Crafting a wooden door by hand also leaves room for human error, which may mean an ill-fitting door that leaks air if the craftsman is unskilled. After installation, homeowners can add weather stripping around the door to ensure air won’t leak. The Winner – Fiberglass doors are the clear winner for energy efficiency. If lowering your heating bill and protecting the environment are a concern, fiberglass is the way to go. Fiberglass – Fiberglass doors can be painted and stained to look like almost anything. It’s even possible to create a door that looks like wood, if that’s the homeowner’s preference. If you don’t like the look of a wooden door, you can keep the door looking smooth and paint it any color you like. The technologies for creating your ideal-looking door are constantly improving. Wood – There’s no denying that wood is beautiful to look at. With a wide variety of wood types and stains to choose from, there’s something for everyone when using this natural material. Though wood is appealing to many homeowners, not everyone enjoys its appearance. One advantage of a wooden door is the potential for beautiful carvings, though these can be costly. A wood door offers some lovely variety, but not an exceptional amount like a fiberglass door. The Winner – This is a close call, but the winner has to be fiberglass, even though the beauty of wood can’t be denied. Since a fiberglass door can achieve a wide variety of looks, comes out on top as the winner for appearance. Fiberglass – This material is designed to hold up against rough weather, particularly moisture. Water damage can cause huge problems to a home, but fiberglass is designed to stand up to rain and other extreme weather conditions. Water resistance means your fiberglass door won’t warp, rot, or deteriorate, allowing it to last for decades. It also doesn’t expand or contract, meaning it won’t leave any gaps in your doorway depending on the season. Wood – In all areas of the home, wood is notorious for rotting when it comes in contact with too much moisture. To prevent this from happening, wood needs to be treated to stand up to moisture and weather. This treatment will have to be redone regularly, to ensure the door will last for many years to come. The Winner – The fiberglass door wins in this category. Having a door made from materials that are designed to stand up to extreme weather means a lot less stress for the homeowner. Fiberglass – Since it’s designed to hold up to extreme weather, fiberglass doors are extremely low maintenance. A homeowner with a fiberglass door won’t have to worry about treating the door for varying weather conditions, or checking the door for damage. Fiberglass is virtually scratch and dent resistant, making it very resilient. At most, a homeowner may wish to wash their door with an all-purpose cleaner and water if it gets dirty. Wood – Since wood can easily be affected by weather, a wooden door will require regular maintenance. This means the homeowner will need to treat their door to protect it from weather. Wooden doors can also scratch easily, and paint can peel rapidly, requiring additional maintenance and regular up-keep. The Winner – Fiberglass wins again! For homeowners looking to add a door that’s easy to maintain, fiberglass is the clear choice. Fiberglass – The price of doors in general can vary widely, depending on the customizations that the homeowner prefers. A basic, fiberglass door without many bells and whistles won’t cost much, and is easy to install into standard sized doorways. Also, thanks to fiberglass being highly energy efficient, homeowners will save more money in the long run on their heating and cooling bills. Wood – Similar to fiberglass doors, the cost of a wooden door depends on what the homeowner wants. Hiring a skilled craftsman to carve a one-of-a-kind door will be gorgeous, but costly. In addition, wooden doors don’t offer much energy efficiency unless the homeowner pays an additional cost for energy efficient windows and energy efficient weather stripping.Wood is still vastly more expensive than fiberglass. A wooden door may still be a good option for some, but when it comes to practicality – and even beauty – fiberglass wins in nearly every category. Consider the kind of investment you want to make in your home when purchasing a new door, and discuss the options with your contractor. You may find that investing in a fiberglass door is the best choice for you. Are you convinced to get a fiberglass entry door? Feldco is Peoria’s the best place to get one. They’re also installed by factory trained and certified professionals to ensure that you’re getting the best qualty. Get a free quote now and see why over 350,000 homeowners have trusted us with their home improvement needs.